As the Christmas break fast approaches, it is important to make time at home to have fun as a family. As a parent, you may be busy with a jam-packed workload and keeping your children stimulated over the festive break should not be forgotten. At Wandsworth Preschool, we want everyone to make the most of the holiday period to spend quality time together and continue to learn and develop. Our experienced staff have a few activities to suggest that are great for the festive break. Some are things we do at this time of year as a tradition; some are things we mean to get to all year but don’t, and some are things that just need to be done! Children get very excited about decorating the house with festive ornaments and treats. They throw themselves into it with more energy than most adults. Making decorations is not only a great way to spend time with your children but is also perfect for developing their skills outside of preschool. As your children get older you can put them in charge of decorating. This responsibly will challenge their organisational skills as well as letting their creativity flare. There are many creative decorating projects kids can do, from cutting snowflakes, pine cone strings, making festive cards, felt bauble decorations and so much more. Wandsworth preschool encourage your child to get creative in the most amazing ways, allowing them to create pieces of music and to act out stories. Creating a talent show at home is a great activity for children of all ages, including parents. Get your children dancing to their favourite music, singing their favourite songs or reciting a piece of poetry. Practicing their act is great for developing their cognitive skills, memory and creative talents. As a parent, if you are busy with work, your children can put together a show for you to watch later in the day. What is there always lots of at this time of year? That’s right, Food. 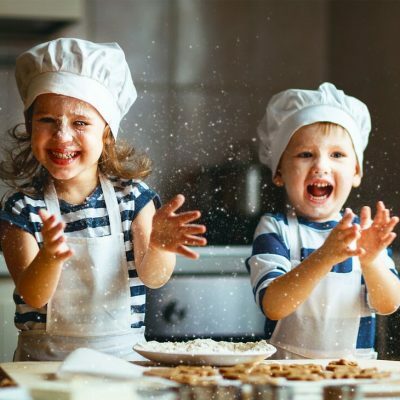 Baking goodies is a perfect way to teach your children the importance of measuring ingredients, and about how ingredients change when subject to the heat of the oven. Add activities to keep your little ones engaged while you are doing more complicated baking tasks such as putting the raisins on the biscuits or sprinkles on the cup cakes. In the UK, we are lucky if we receive a white Christmas. You should take advantage of this frosty weather and let your children get out the sled or snow tube. Have fun in the snowy weather, as long as your little one is wrapped up warm. Children love looking at frost and icicles and there is nothing to beat a walk in cold weather. Nothing says a heart felt gift like a homemade gift. Children are the best at getting creative and creating gifts with passion and love. As a parent, receiving a handmade present from your little one is lovely. Depending on the age of your child, you can either supervise them or let them free with creativity. Your children’s homemade gifts don’t just need to be for parents, you can share them with the whole family at different times of the year. We are proud of the range of activities we encourage our children to get involved in. Exposing them to different creative tasks is just one way we are dedicated to developing their skills and talents. At The Wandsworth Preschool, promoting sensory development is at the heart of our younger children’s curriculum as we aim to help develop children’s interest and curiosity in the world around them, their concentration and self- confidence. We provide a wide range of sensory activities at this time of year such as play dough that is scented with cinnamon and cloves, exploration activities that enhance the use of the sense of smell as they cut cinnamon sticks for example. This is a time for festivals of light, both Christmas and Hanukah and so work with shiny paper and talk about candles and star lights and of course there are many seasonal songs to sing and play percussion instruments to. If you have any questions, please don’t hesitate to give us a call on 020 3319 7330.